Did you graduate from 2nd grade? Can you tell the difference between letters and numbers? Can you read the words that are in front of you right now? Seems easy, right? Yes, it is hard to imagine that there are people out there that don't know when it's right to use letters or numbers, but they are out there, huddled in the darkest corner of their parents' basement jacked up on Mountain Dew Game Fuel searching for the latest hackz for Halo 3. Ladies and Gentlemen, you're about to enter the world of l33t speak. What the crap is that? I'm glad you asked. 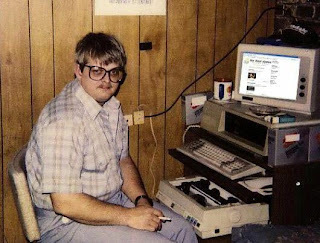 "(Internet) Gamers commonly substitute numbers and symbols for the letters they resemble, creating what they call "l33t speak" — that's "leet" when spoken, short for "elite" to the rest of the world." So basically, there's a subculture of internet gamers that are so lazy and outcast that they decided to make their own language up where they stick numbers into the middle of words where they don't belong? Look, I'm all for people being able to do their own little dorky thing as long as it doesn't come into my life unexpectedly. But guess what? That's exactly what happened. According to a story that came out this morning, Merriam-Webster's Word Of '07 is "w00t", a commonly used l33t word. No, not "woot". It's "w00t" numbnuts. Get it right. Apparently if you spell it wrong, you're opening yourself up to some major pwnage. Apparently, there was an online poll on the Merriam-Webster website to decide the word of 2007. Let me say that again...there was an ONLINE POLL to decide the word of 2007. Online poll? Was there any doubt that w00t would win? Who else has the time or lack of social life to vote on the official website of a dictionary for the word of the year? People who use the word w00t, that's who! This is all a continuation of a recent pattern of old people that decide stuff to seem more young and hip than they really are. When TIME magazine named "You" the person of the year last year, that was the start of it. I would have been fine with it if it had stopped there, but it didn't. Soon, the iPhone was named the invention of the year, Brittany Spears' new album got good reviews, The Departed won Best Picture, etc. It's just old farts trying to show that they are young and cool and showing that they are hip to Generation Y. This would have worked a few years ago, but now it seems like too little, too late. Other '07 words that were contenders were quixotic, hypocrite and conundrum. My personal favorite was "blamestorm" which is a meeting in which mistakes are aired, fingers are pointed and much discomfort is had by all. The timing would have been perfect, because after losing out on Miguel Cabrera and Fukudome to a division rival and a crosstown enemy respectively, I'm sure there's quite a few blamestorms going on in Kenny Williams' office right about now. Early favorite on the Word Of 2008? Fukkake. Spread the word. "OMG!!11! 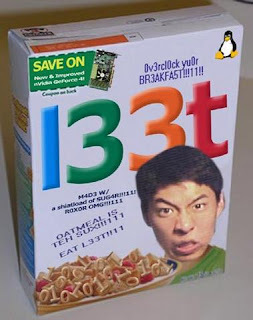 L33T CEREAL IS TEH SHZT!!1!!LOLZ!!!1!"